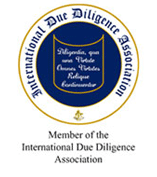 The CLEAR Business DirectoryTM is proud to be affiliated with the International Due Diligence Association (IDDA). We are proud to contribute to the international business community in establishing and leading the way for the Due Diligence Standards. Your customers want to know they can trust you and your business. And you want to know you can trust the service providers and team members you engage. Learn how to leverage trust in business so you can mitigate risk and increase your profits. Trust is the most crucial element in business today. Learn how to make it a pillar of your business culture. In a world of almost unlimited business service providers, learn who you can trust before you hire them. Learn the relationship between transparency and trust and how both can impact your profitability. Learn how to be a powerful and trusted referral partner. Justin and Tonya Dawn Recla are Army veterans and former government agents who bring over 20 years of combined counterintelligence experience to the business world. Their first business venture created an affordable due diligence and vetting process for start-ups and small businesses. For the first time, small business owners could make sure potential partners, investors, or service providers were who they said they were and could do what they said they could do. They then created The CLEAR BusinessDirectoryTM, the first fully vetted resource that encourages businesses to operate in transparency. From the spy world to the business world, the Reclas are changing the way B2B transactions get done and Protecting the People of Small BusinessTM.